The attribution of the large painting of the Madonna from the Florentine church of the Ognissanti (All Saints), now housed in the Uffizi Gallery, derives from a written notice from the early 15th century. The panel, described as the Ognissanti Madonna after the church in which it was originally installed, has the same strength of representation as the frescoes at Padua, and is therefore dated by art historians as having being painted in the first decade of the l4th century. From the moment we look at the wooden panel painted in tempera we are fascinated by the gleaming solemnity of the paintwork. A fine web of golden edgings on the robes, of halos, and of decorative elements blends the golden hue of the background with the representation as a whole. Both the delicate shades of violet and pink, the warm green and red, and the flesh colours of the figures thus take on a brilliant luster, which allows the panel to shine with incomparable splendour. Giotto turns to a type of picture known as the Maest� – the Madonna surrounded by saints and angels – which is especially well-known because of the Maest� by Duccio, begun in 1308, the one-time altarpiece of the cathedral at Siena, and through the great fresco in the Sienese Town Hall, completed by Simone Martini in 1315. These two examples of mature Sienese art have a relatively wide format: the numerous saints kneel and stand in rows to the left and right of the Virgin’s throne. There they could be said to lead a “life of their own” — some look into the centre of the picture, others look at one another, and yet others direct their gaze out of the picture. 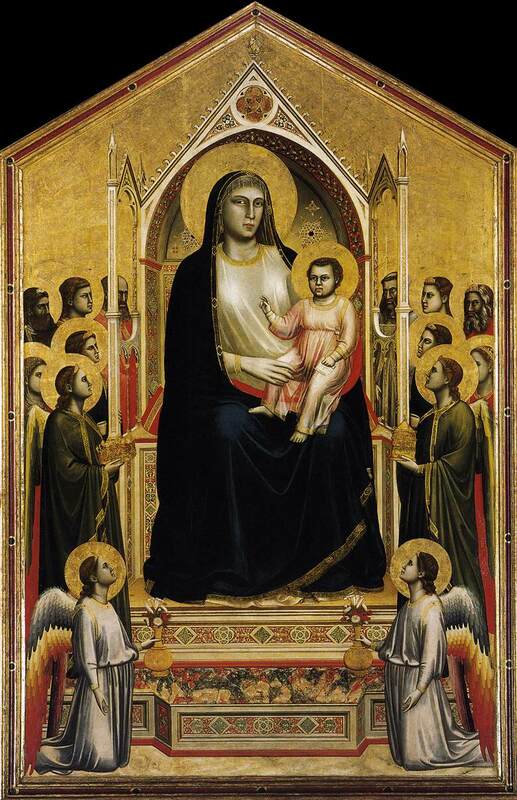 Giotto’s panel, on the other hand, is vertical in format and thus approaches the size and proportions of an older type of portrayal of the Madonna. This aspect is made particularly clear in the Uffizi Gallery in Florence, where the Ognissanti Madonna is exhibited next to Duccio’s Rucellai Madonna and the Madonna S. Trinit� by Cimabue, both of which were executed in the 1280s.